Welcome to NinjaGram, the world's #1 Instagram bot. This proprietary and versatile marketing software handles all of the repetitive grunt work, SAVES you large amounts of time, gets you thousands of followers, and helps you generate more profit from this wildly popular image sharing website! Target users/photos by keyword search, tag search, user's followers, user's friends, your feed, URL, recent comments or likes. 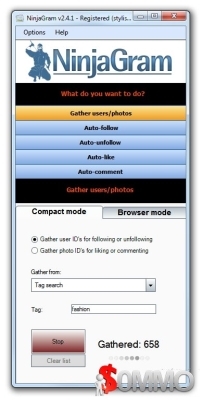 Auto unfollow (you can exclude users you followed less than X days ago or users who haven't followed you back). SUPERLIKE! Like targeted users' last 5 photos. Extremely effective method to gain more followers. Like a person's most recent photo when following them.